I’m getting ready to start selling in a local shop (yay! )… on the 1st! (yikes!) So it’s major crunch mode building my inventory. Especially since I’m trying not to take anything out of my Etsy shop. But luckily I’m getting quicker and more efficient so I’ve had some very productive days. Still not sure how it’s all going to come together… really need to spend some time on labels and sales tags! After a couple days of napping all day, Apple seems to feel she ought to make up for her absence from the studio by being extra needy. For three days now she has never been much further than an arm’s distance. Which is to say, in the middle of everything. It’s nice when she’s just sitting watching. Not so helpful when she starts pushing things off the table for attention or rubbing against the sewing machine while I’m sewing. Sigh. 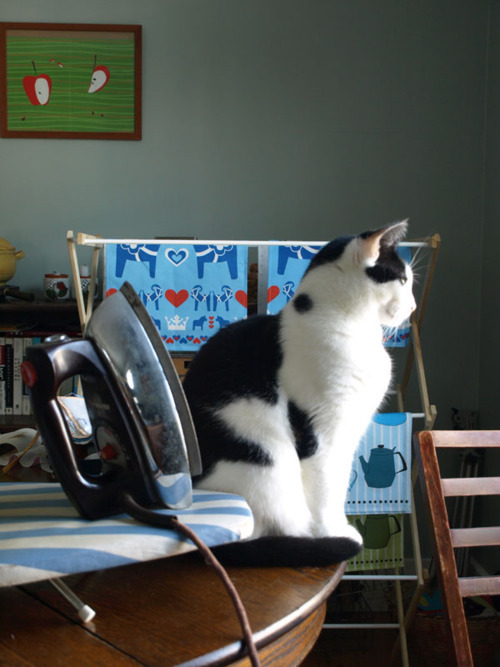 (Photo: Tea towel production mode, and Apple warming herself by the iron).